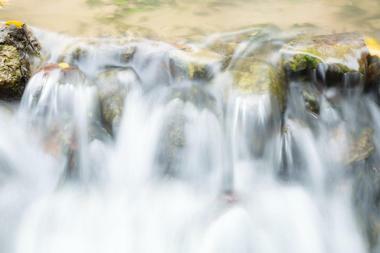 Hiking to one of hundreds of waterfalls is one of the most popular outdoor activities in Tennessee. The Highland Rim and Cumberland Plateau are known for gorges, cascades, rock houses, and waterfalls snuggled into lush forests. 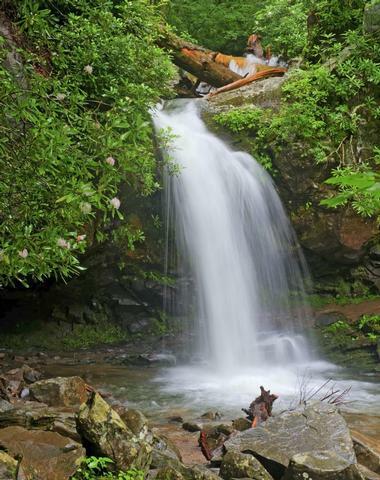 Most falls are located in one of many Tennessee parks, such as Great Smoky Mountains National Park. 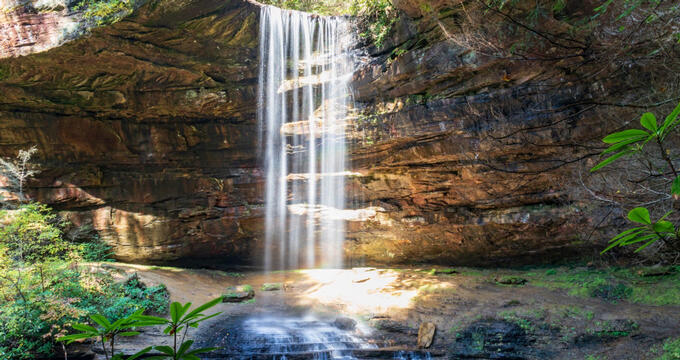 Located on the Cumberland Plateau, a short driving distance from Chattanooga, Virgin Falls and Big Laurel Falls can be reached by a pleasant 9-mile loop hike through the Virgin Falls Pocket Wilderness. This easy hike will reward you with four waterfalls, many smaller subterranean tributaries, a cenote, and spectacular views. You will reach Big Laurel Falls after 2 miles. The trail goes around the huge mouth of the cave until reaching the forest floor. Big Branch Creek flows underground away from the falls. One of the most interesting characteristics of the Pocket Wilderness is its karst rock, which forms fascinating features. Virgin Falls is formed when the high-volume Big Branch Creek comes out of a cave and runs above ground for several feet, before plunging vertically 110 feet. 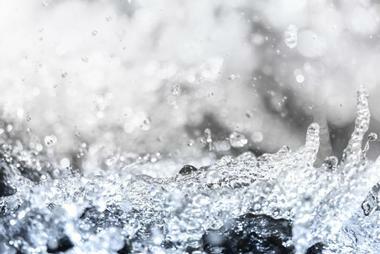 Once it reaches the bottom, the water again disappears underground. Located in Great Smoky Mountains National Park, the hike to Hen Wallow Falls runs through lush hemlock and rhododendron forest. The hike to the falls is a 4.4-mile roundtrip considered moderately difficult. It starts at the Cosby Picnic Area as the Gabes Mountain Trail before a marked side trail takes you to the base of the falls through a series of steep switchbacks. At the top of the falls, Hen Wallow Creek is only 2 feet wide before it drops 90 feet and spreads to 20 feet at the base. Look for salamanders at the base of the falls. The waterfall freezes into a beautiful icy column during some exceptionally cold winters. Black bears can also be encountered in the area. 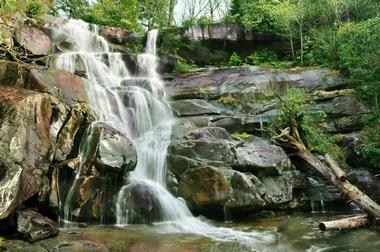 The highest waterfall in Great Smoky Mountains National Park, Ramsey Cascades can be reached by a wonderful 4-mile hike through a lush hardwood forest. The hike is considered moderately difficult because of 2,000 feet of elevation gain. Most of the trail is pleasant walk through the forest and the only difficult and steep part is just before reaching the falls. 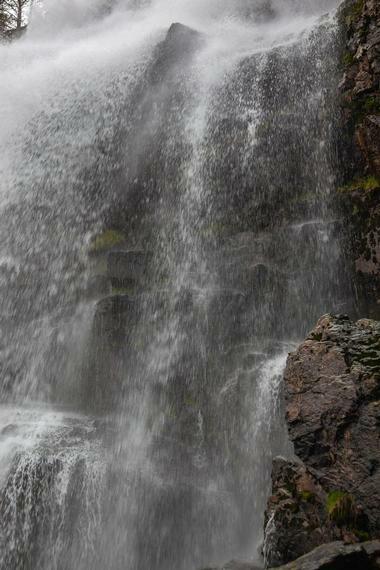 The fall spills for more than 1,000 feet over a series of large boulders. 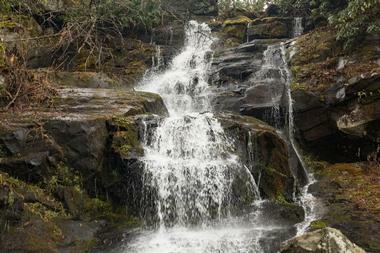 Ramsey Cascades is considered one of the crown jewels of Great Smoky Mountains National Park. The trailhead is located about 6 miles from Gatlinburg at the Greenbrier entrance to the park. 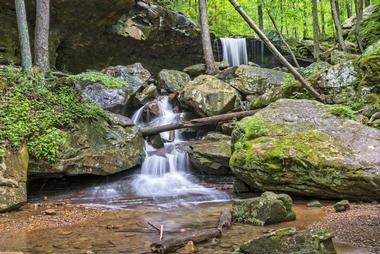 The Middle Prong Trail is one of the most popular waterfall hikes in Great Smoky National Park. Indian Flats Falls is just one of the three major falls hikers pass by, in addition to many smaller falls and cascades. The fairly easy 8-mile trail passes through a forest full of wildflowers, such as trilliums, violets, wood sorrel, toothwort, and foamflower. The Middle Prong Trail used to be a railroad route for the lumber industry out of the small mountain town of Tremont. You can see some town remnants along the way. With an elevation gain of 1,140 feet, the trail is at times strenuous and in parts technical, but it is well worth it. 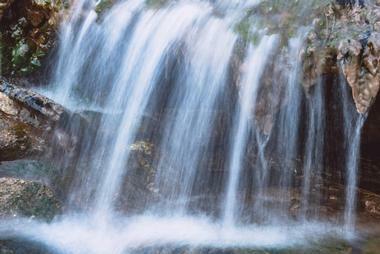 Indian Flats Falls is magnificent three-tier waterfall with water dropping about 60 feet in total. The top tier is the highest, dropping about 20 feet. The middle tier is close to the end of the trail. The trail can be very crowded in the summer. Grotto Falls is the only waterfall in the Great Smoky Mountains where the trail runs behind the falls. The beautiful 25-foot cascading fall can be reached by taking the Trillium Gap Trail off the Roaring Fork Motor Nature Trail. The 3-mile long round-trip trail is considered moderately difficult, with an elevation gain of 585 feet. It runs through a lush hemlock forest full of wildflowers. You can see white violets, delicate stitchwort, and of course trillium. The shady, moist forest makes the hike very pleasant. The trail passes over several small streams without any bridges before reaching the falls. The best time to visit Grotto Falls is in spring, not only because of all the wildflowers but also because of the large volume of water that makes the fall truly magnificent. Located in a remote part of Great Smoky Mountains National Park, Fern Branch Falls is located in a steep ravine, a bit set off from the trail. It can be reached by an easy to moderate 4-mile round trip hike. The trail follows Porters Creek and passes by Messer Farm, Smoky Mountain Hiking Club Cabin, Ownby Cemetery, and masses of wildflowers before reaching the falls. The trail runs through a dense forest that makes it shady and pleasant. Many of the streams the trail crosses are full of fish, so some hikers take a break and throw in a fishing rod. Fern Branch Falls is not marked and is hidden by heavy brush. It takes a bit of a scramble to reach the base of the fall in a heavily wooded ravine. The falls spill 40 feet down an almost vertical, moss-covered rock. Laurel Falls and Snow Falls are both located in the 2,259-acre Laurel Snow State Natural Area on the Walden Ridge of the Cumberland Plateau. The trail follows cool, deep coves past historical ruins, blue holes, two massive waterfalls, and spectacular overlooks. From the trailhead, the trail runs for about 1.5 miles along Richland Creek, past some old mines and a reservoir. The right fork off the trail along Laurel Creek reaches the 80-foot-high Laurel Falls. The left fork runs for about a mile and a half before reaching the 35-foot Snow Falls and Buzzard Point with 300-degree views of the Cumberland Plateau. The trail is strenuous at times, with a series of switchbacks going uphill. Stinging Fork Falls is located in Stinging Fork Falls State Natural Area near Spring City, Tennessee. The falls can be reached by the Stinging Fork Falls Trail. The hike is moderately difficult and runs along a creek through lush woods and over mossy boulders. The first part of the trail is flat and easy until the fork in the trail. One branch leads to the falls and the other to a spectacular overlook. Once you start walking towards the falls, the trail will start going down in a series of steep switchbacks before reaching the bottom of the 35-feet Stinging Fork Falls. The falls spill over a rocky ledge into a deep pool. Margarette Falls is a scenic fan-shaped, 60-foot fall located in the Cherokee National Forest near Greenville, Tennessee. The falls can be reached by a trail that starts in an area that was once a thriving logging camp. The first half a mile of the trail is an easy hike on a Forest Service road. The trail winds through large moss-covered rock formations, over and around many small falls and cascades, and is often slippery. It makes four creek crossings as it runs through the gorge to the falls. 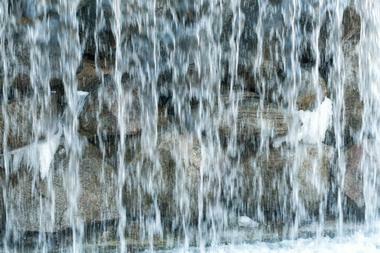 The falls is magnificent combination of cascades and free-falling water over a steep rock face. Located in Frozen Head State Park near Wartburg, Tennessee, Emory Gap Falls can be reached by starting at the Panther Branch trailhead. It is an easy hike suitable for kids and older folks and is dog-friendly. 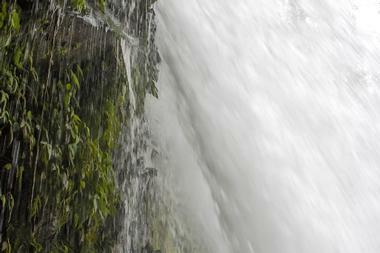 A short hike will take you first to the 12-foot Debord Falls just off the trail on the right side. There are wooden stairs that go to the bottom of the falls. As the trail continues, it splits at one point to the Emory Gap Trail, which will take you to the falls. The trail runs through lush forests full of wildflowers. The 24-foot-high Emory Gap Falls plunges over a rock edge onto boulders, and from boulders into a plunge pool, surrounded by a rock house.